Designed to teach scanning a line of type to improve reading, word recognition and discrimination skills. Different from Symbol Discrimination and Letter Tracking in that the learner does not look at each letter or symbol individually, but differentiates real words from nonsense groups of letters. 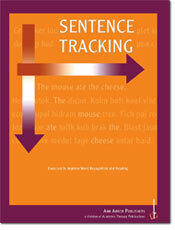 Sentence Tracking aids in vision training by correcting problems with left to right eye movement, omissions and reversals. It also helps students learn correct spelling and usage in sentence structure. Can be timed to give the learner positive feedback. 3rd to 4th grade reading level. Type size ranges from 16 to10 point. Reproducible.